My answer is an enthusiastic YES! but…..
stays on top of the privacy settings. 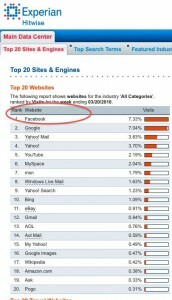 Facebook can be a place for business and becoming more so all the time as the population of Facebook evolves. 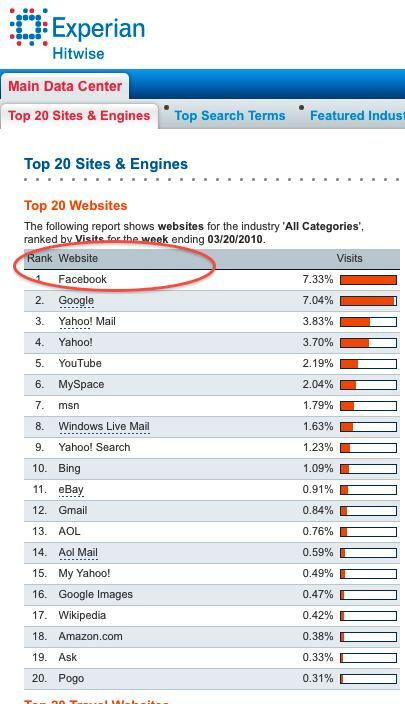 Just this month, Experian Hitwise reported that traffic on Facebook surpassed Google to become the number one website in the U.S. 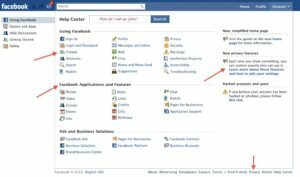 This post is the first in a series on Facebook for individuals who want to establish a business presence. The next post will cover more privacy settings and ideas for projecting a business image on Facebook, but for now, if you currently have a profile on Facebook and if you have not already visited your SETTINGS this month, I HIGHLY recommend that you go through each and every option under your ACCOUNT tab—settings, privacy, applications and HELP as soon as you’re finished reading this post. Open the HELP link, first, before going through your Settings. There you’ll find explanations of the various features and settings and what they mean. After browsing the Help tab, set up some LISTS. Privacy settings are very important and in order to use them to the fullest extent use Lists. 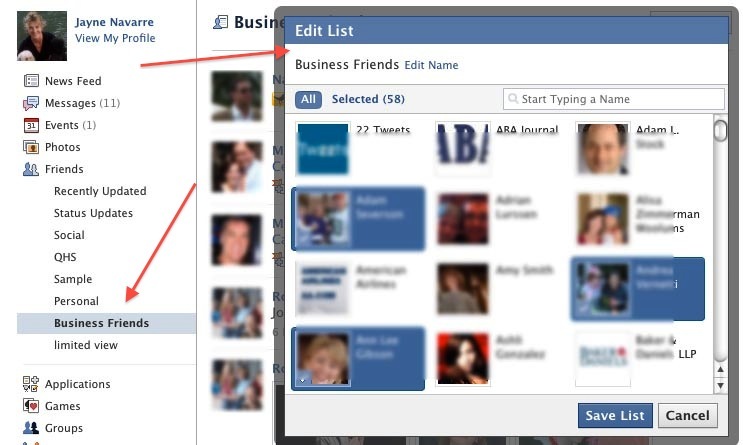 Privacy settings allow you to customize who sees what according to LISTS as well as individuals. Establish lists such as Family, Business, Limited View, Alumni, or even something like Casual Acquaintances. You can create your LISTS from your FRIENDS page. There’s a tab in the upper right hand of the center column that says CREATE A LIST. Cick it and it will prompt you through the process. You can select people from your Friends to add from the Create List tool, or you can create all your LISTS, and then from the sidebar of your page, select the list and click on the edit button. It will allow you add people to the list. Once your lists are established, go back to the ACCOUNT tab and begin adjusting your settings. Select CUSTOMIZE on any feature or application to lock down certain items according to your LISTS. Commit the time to thoughtfully determine your privacy settings. That is no small task. 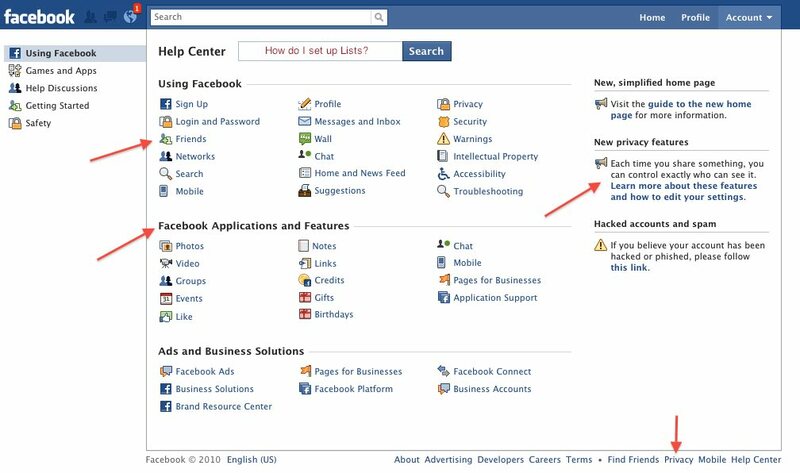 Just the other day while teaching business development strategies on the social web to a sharp group of attorneys, I presented the privacy settings on Facebook. The overwhelming sentiment was “That’s too complex and too time consuming.” And, I have to agree it can be. At first, the privacy settings are overwhelming, and worse, Facebook adds new setting controls frequently, forcing a contentious user to review their settings at least monthly if not more often. However, if you learn to use LISTS and SETTINGS your Facebook experience can be productive and the initial time you spend on those two things will be a wash. The thing about business development and marketing is that you should do what pleases you. Be somewhere you enjoy being because this communicates a lot to prospects with whom you engage. Creating lists and checking your settings should give you enough to do for a couple days. Stay tuned to the Virtual Marketing Officer blog for more on FACEBOOK how-to’s for business development. Subscribe! Or, leave your comments below….Thanks. THANK YOU! Presently putting together a presentation to introduce social media to firm: What is it? Why should you care? Dos and Don’ts and Getting Started. This is so helpful – thank you. Glad to help you. I am frequently engaged to help law firms get started on the social web and after doing this for two years now I still find the task overwhelming. There are so many moving parts and deciding on what to include is always a challenge. As for the why should you care part, I always include a section on search. A lawyer’s online footprint is becoming more critical than the firm’s own website. If a lawyer doesn’t own the first page of results for their name or the firm’s name they lose credibility. Further, those results should come from articles published on third party websites, mainstream media and other activity that underscores the lawyer’s reach, influence and reputation in their practice. Good luck with the presentation. Let me know if I can help in any way. We are in Atlanta, and I have been thinking about facebook and linked in for a long time. Since we are in the midst of the major snow storm, this maybe my “window of opportunity” to get onboard. Any suggestions would be appreciated. Thank you! Happy snow day! Facebook is a just tool. And, like all marketing tools you need to invest the time in learning how to use them and this is a continuous process as new media continues to evolve. The level of success you will find is determined by the amount of time you put into it: posting, friending and reading others’ posts. So, while you may have time today, make sure you have time tomorrow and the next day to keep up with it. I find a lot of attorneys in my travels that are using it to connect to past colleagues, clients and referral sources, but again, you have to invest the time to “be there.” That being true, it’s not just about you. Facebook is best served when you interact with others’ posts and be social. It’s like the country club where business and recreation mix. So, if that sounds good, go forth!! !